It's easy to argue about the hypothetical causes and effects of global warming. It's a lot harder for any serious disagreement to continue when extreme weather is demolishing a major American city. The U.S. experienced just such a moment of clarity last year when Hurricane Katrina laid waste to New Orleans, awakening all of us to the true cost of climate change. It was Kerry Emanuel, an atmospheric scientist at the Massachusetts Institute of Technology, who helped us make the connection. 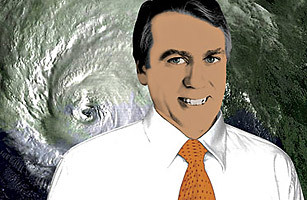 Less than a month before Katrina hit, the journal Nature published an extensive study that Emanuel had conducted in which he surveyed the power of roughly 4,800 hurricanes going back decades. His findings are as damning as they are scary. In that span of time  the period during which climatologists have been warning that greenhouse gases are steadily raising atmospheric and ocean temperaturesthe power of the storms doubled. Warm ocean water is like nitroglycerine for hurricanes, and while many researchers had been predicting an explosion of more powerful storms, Emanuel, 51, offered evidence that it was actually happening. "I didn't expect to get people's attention with this paper," he says, "but the timing, so close to Katrina, may have helped wake them up some." Wake up they did. According to a TIME/ABC News/Stanford University poll, 85% of Americans now agree  about as close to unanimity as a fractious population like the U.S.'s ever reaches  that the earth is growing warmer. Emanuel alone did not drive us to that understanding. But just as nature has its trigger points, so does public opinion, and Emanuel was clearly one of the forces that nudged us across an important line. Before you can begin to solve a problem, after all, you have to accept that you've got one.